Philosopher, Marxist, professor, murderer. More than a quarter century after his death, Louis Althusser, one of the most influential leftist thinkers of the 20th century, remains an enigmatic figure: a man whose work rejuvenated Marxist theory through books such as For Marx and Reading Capital, a Communist who strove to create a new framework following the revelations of Stalinist terror... and a victim of mental illness who, in his darkest moment, strangled his wife of more than 30 years. ALTHUSSER, AN INTELLECTUAL ADVENTURE traces the development of Althusser's thought, which influenced a who's who of French philosophers, including Lacan, Foucault, Derrida, and Barthes. 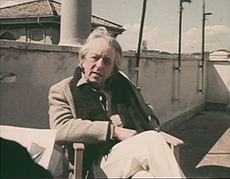 Credited with reinterpreting Marx in a way that encouraged readers to engage directly with his work, Althusser brought the Freudian concept of overdetermination to Marxist theory, and argued that Marx's work should not be read as one consistent whole, because there was a clear 'break' between his earlier and later writings. But Althusser's most enduring contribution may be the concept of ideological state apparatuses: institutions and social structures including schools, churches, and families, that serve to reinforce the capitalist state. 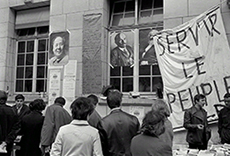 The film also delves into Althusser's little-understood struggles with the mental illness that would see him hospitalized numerous times throughout his life. In intimate letters to his wife, Helene Rytmann, and mistress, Franca Madonia, Althusser describes his treatment and mental states. As Yves Duroux says, in order to understand the man, one must look not only at his philosophy and relationship with the Communist Party, but to "his own madness" which in some ways linked the two. ALTHUSSER, AN INTELLECTUAL ADVENTURE captures the man, and the implications of his work, in interviews with friends and colleagues such as Lucien Seve, who served more than 30 years on the central committee of the Communist Party of France, and with philosophers and former students including Etienne Balibar, Pierre Macherey, and Jacques Ranciere. Throughout his life Althusser avoided the spotlight, preferring to be a behind-the-scenes theoretician arguing the case for Marxist revolution. But included in this film is the only TV interview he gave, shot on a rooftop in Rome in 1980—just weeks before he would kill Helene. The thought and ideas of the French philosopher Gilles Deleuze, and his impact on creative work and communities around the world. Captures the energy and fierce intellect of the philosopher and the key, sometimes contradictory, elements of his work.